Histology: The lesion is a large multi-lobated mass comprised of spindle cells with wavy nuclei and tapering ends. In most areas, the lesion is hypocellular with a myxoid matrix (Antoni B); some areas display more cellular areas (Antoni A). There are prominent bands of nuclear palisading (Verocay bodies). There are scattered blood vessels within the lesion, but there is no notable hyalinization. Mitotic activity is rare, and necrosis is absent. By immunohistochemistry, the lesion is diffusely positive for S-100. 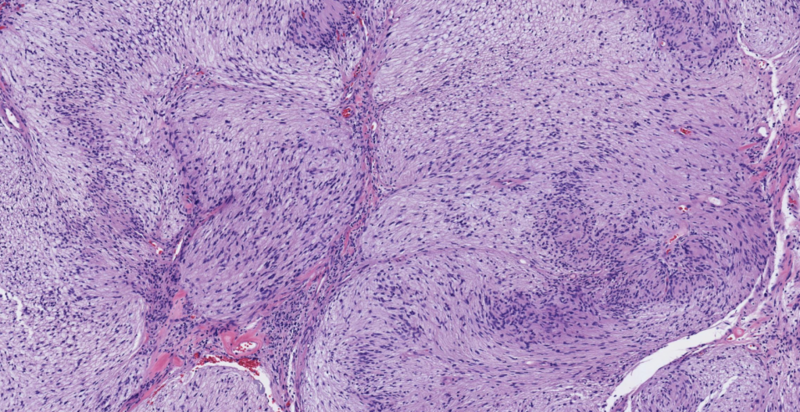 Discussion: Schwannomas are benign peripheral nerve sheath tumors that are comprised of neoplastic Schwann cells. They can occur throughout the body, including in the spinal cord. The lesional cells characteristically display wavy nuclei with tapered ends that may be arranged in palisaded rows termed “Verocay bodies”. The stroma may be myxoid, as is seen in this case. Regions of hypercellularity are termed “Antoni A” regions, whereas hypocellular (and often myxoid) areas are terms “Antoni B” regions. There are a number of variant morphologies, including the cellular, epithelioid, and melanotic (pigmented) schwannoma variants. Marked degenerative atypia can be seen in “ancient” schwannomas. 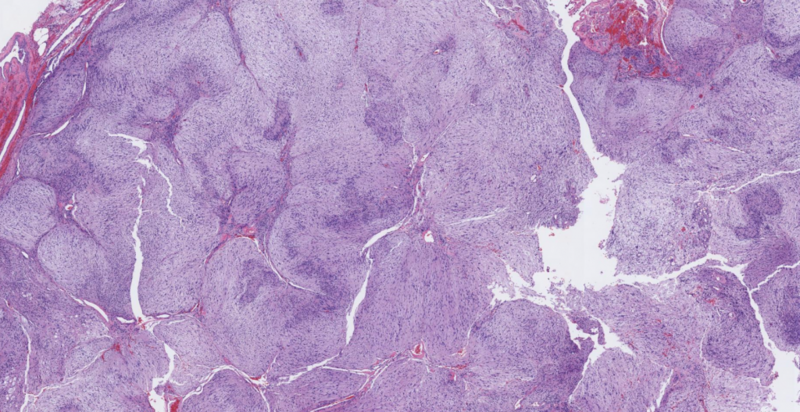 Schwannomas are diffusely immunoreactive for S-100 and Sox10; in contrast, neurofibromas are typically focally immunoreactive for S-100 and Sox10. The differential diagnosis of a spindle cell or myxoid lesion in the spinal cord includes chordoma, meningioma, myxopapillary ependymoma. In addition to histologic clues, immunohistochemistry can resolve the diadnosis. Chordomas are immunoreactive for brachyury in addition to S-100; meningiomas are immunoreactive for EMA and PR; and myxopapillary ependymomas are immunoreactive for GFAP, but can also sometimes label for S-100. 1.Jessen KR, Mirsky R. The origin and development of glial cells in peripheral nerves. Nat Rev Neurosci 2005;6(9):671-682. 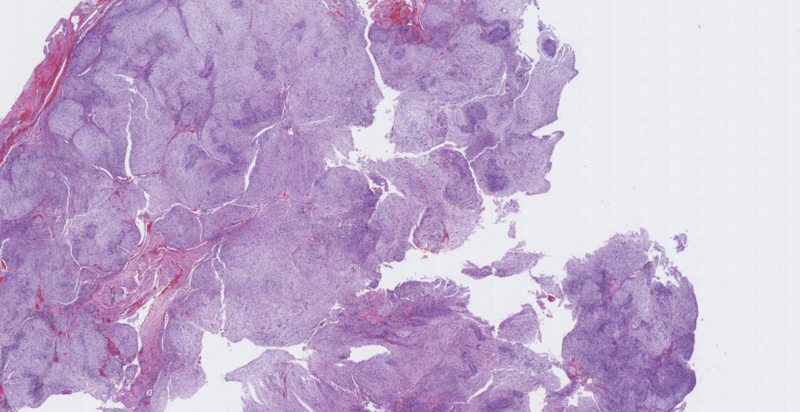 2.Fisher C. Immunohistochemistry in diagnosis of soft tissue tumours. Histopathology 2011;58(7):1001-1012.